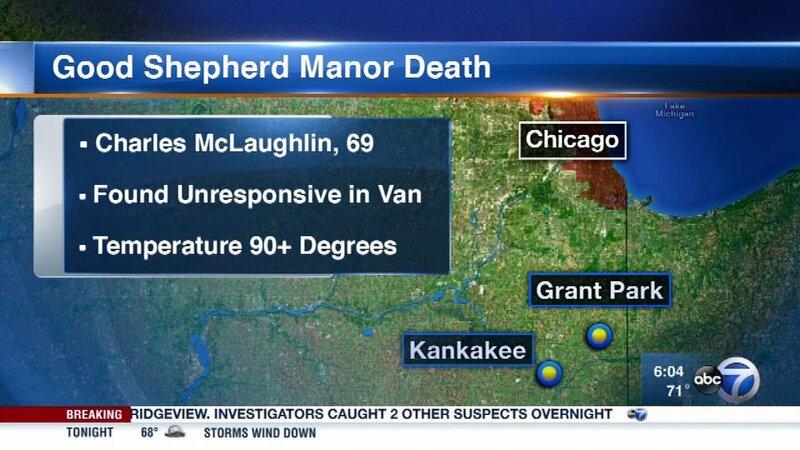 MOMENCE, Ill. (WLS) -- An investigation is underway after a resident of a group home for disabled adults was found dead inside a hot van. Kankakee County Sheriff's deputies responded around 5:15 p.m. Sunday to a report of a person not breathing inside a van in the 4200-block of North A. Street in rural Momence, Ill., near Kankakee. After paramedics arrived, the coroner was notified, the sheriff's office said. Charles McLaughlin, 69, was pronounced dead at the scene. An autopsy was scheduled to determine manner and cause of death, authorities said. High temperatures in the area reached more than 90 degrees on Sunday. "The loss of one of our residents is devastating to the Good Shepherd Manor community. The well-being and safety of all residents is the community's number one concern. We are cooperating with the on-going investigation and are not at liberty to discuss the matter publicly. We want to also respect the privacy of the deceased resident and his family."